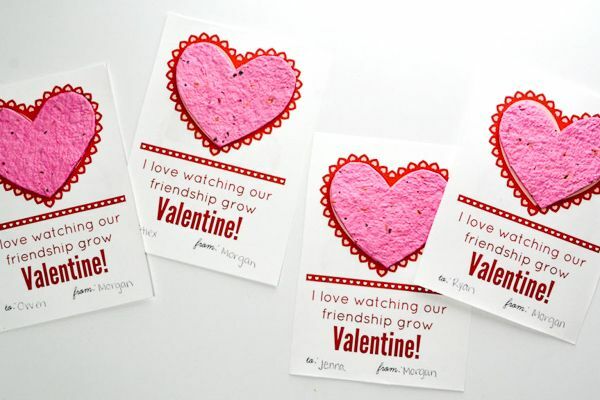 These DIY Seed Paper Valentines are a fun, eco-friendly way to celebrate the holiday without the sweets. Whether you make your own seed paper or buy it pre-made, your friends and family will love receiving these super cute plantable cards. This Valentines paper can be made easily at home with just a few ingredients and you won’t feel the guilt of a sugar rush either. My boys aren’t in grade school yet, but I’m not going to lie – I’m really excited for class parties. I’ve already tasted the lure of them in Pre-K and day care but I feel like they’re only going to get more fun! Maybe it’s because I was totally obsessed with them when I was in school or maybe it’s just because I love holidays, but the thought of tiny desks covered in pink and red and little hands exchanging cards makes me so happy. 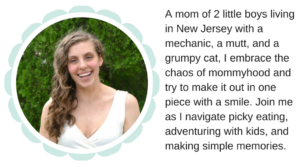 I know that I’m not the only momma trying to keep the sweets to a minimum – and I also think a lot of classrooms (I could be wrong?) require non-food items for class parties, so I got really excited when I came up with this fun DIY. 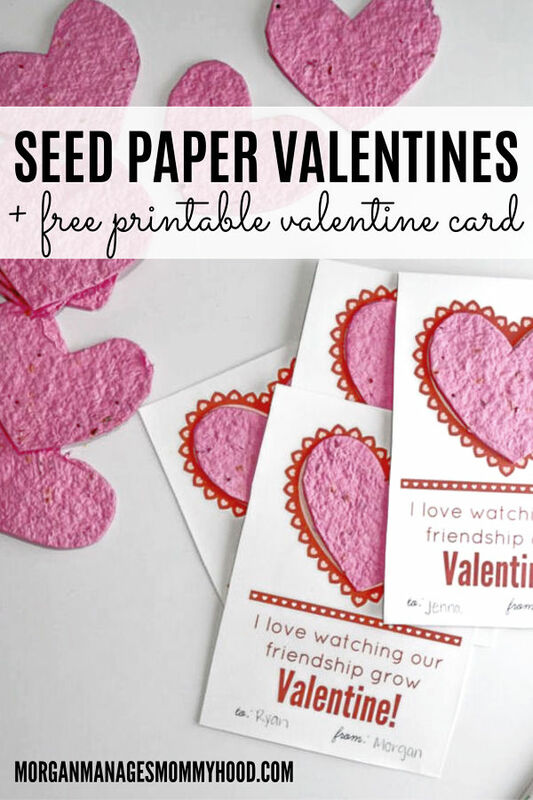 These DIY Seed Paper Valentines are the perfect activity that will cover a few bases – making something fun with your kiddos, a quick little science lesson, and cards for their class – wins all around! So let’ s get to it! The first step in these making seed paper. I always thought the stuff was pretty cool, but never realized just how easy it was to make it myself. ***Before getting into the tutorial, I should note that you can buy sheets of premade (even pre-cut, like these heart ones!) seed paper and skip this part. If you’re unfamiliar, seed paper – sometimes called plantable paper – is recycled paper that has been embedded with seeds. Once planted in soil and watered, the seeds will sprout, using the recycled paper as compost and growing into pretty flowers (or whatever seeds you chose.) Sounds complicated but it’s actually super easy. The first step is to make the paper pulp. 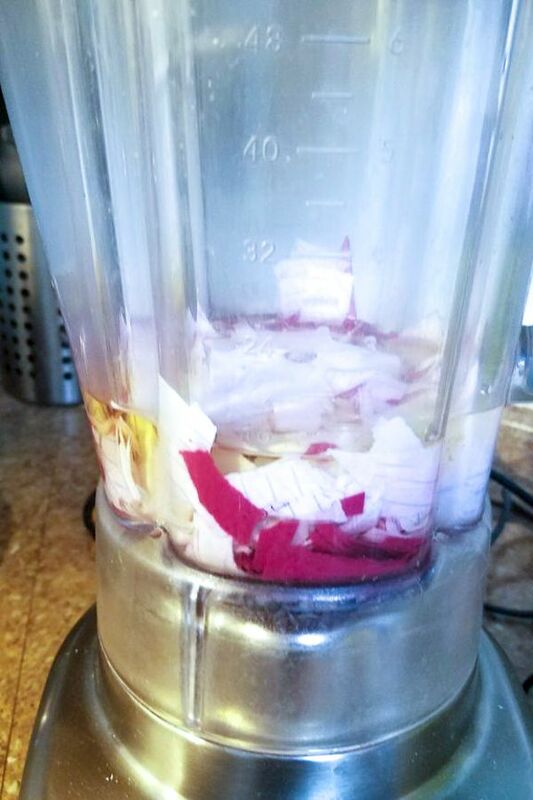 Grab about 10-12 sheets of paper and shred or tear it with about 2 cups of hot water into your blender. I used 10 sheets of normal paper and 2 sheets of red construction paper. I used a mix of old, lined paper I was going to toss and plain computer paper, which is why mine turned out a bit purple-y. My lined paper had blue lines which added a bit of color. You can use any kind of paper – tissue, newspaper, computer, construction, notebook – just make sure there is no coating or plastic on them. Get the kids involved: Tearing up the paper is a great way to get kiddos involved – Ryan loved ripping it up and tossing it in the blender. Use hot water when soaking your scraps for seed paper. Next, soak the paper before blending. Soak your paper at least an hour and then blend. I blended mine to a fine pulp, but a few smaller chunks would add more interest to your paper. Stir in flat seeds for wildflower – for this batch, I used a pack of 1000 wildflower seeds. I don’t see the exact ones I used online anymore, but this pack looks good and costs less than $4. It does have 7500 seeds though, so I would stick to about 1/4 of the packet at first and see how dense they look after that. I recommend sticking to wildflowers since they’re the easiest to actually grow in this setting.For the actual ‘paper’ making, you have 2 options. Make or buy a fine mesh screen (like this one) and spread your pulp on to it before drying, or go my route, which has a few more steps, but can be done without anything fancy. Form and dry out the pulp. Line a cookie sheet with a towel before spreading your pulp on to it. (I used a paper towel but the smoother side of a microfiber towel would would just as well for this. Just be sure to have a few, so that you can switch them out.) Aim for about 1/4 -1/8 inch thick. As it dries, the seed paper will thin a bit more.I used a slotted spoon to scoop out my pulp and remove some water, but do not squeeze the we pulp. Just allow the water to drip off a bit. If the pulp is too dry it won’t spread or stick together easily. Top with another towel, another cookie sheet, and then weigh it down. In about 1 hour I switched out my top towel with a fresh, dry one and re-weighted in order to speed up the process a bit, but I don’t think that’s totally necessary. 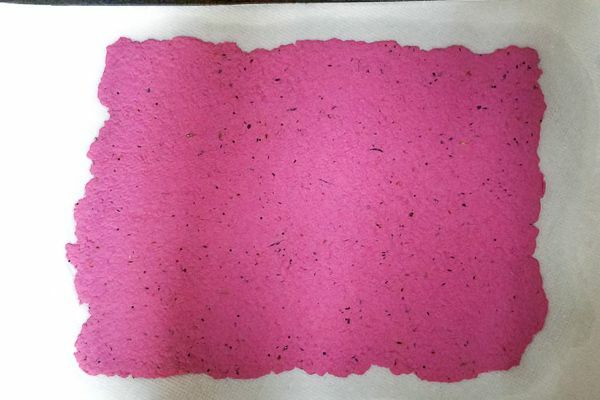 After another hour, remove the top towel and press your paper with towels to try and get as much as possible. By now it should be getting firm – not dry, but firm. If needed, line with paper towels and roll with a rolling pin to remove more water and fix any uneven spots. 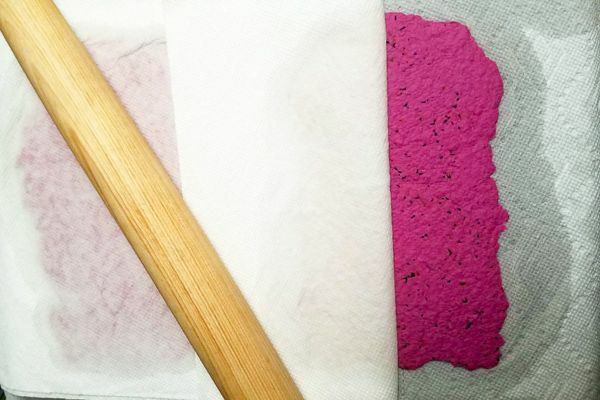 Speed up the drying process by pressing the seed paper pulp between towels and roll excess water out with a rolling pin. This part is kind of tricky – remove all towels from the top of the paper and place a cooling rack (like this one) upside down on your paper. The goal is to gently flip the paper on top of the cooling rack in one piece. If you break it, it’s no big since we’ll be cutting it, but try to keep it whole. Once flipped, remove the top towel GENTLY from the paper and allow your seed paper to dry 12-24 hours until FULLY dried. It probably won’t actually take that long, but you want to make sure it’s totally dried. Once the paper is totally dried, you can assemble! This is the easy part because I made you guys an awesome free Valentine’s day card printable so that you just cut your seed paper, print and cut your cards, glue, address, and go! Simple pimple, you guys. 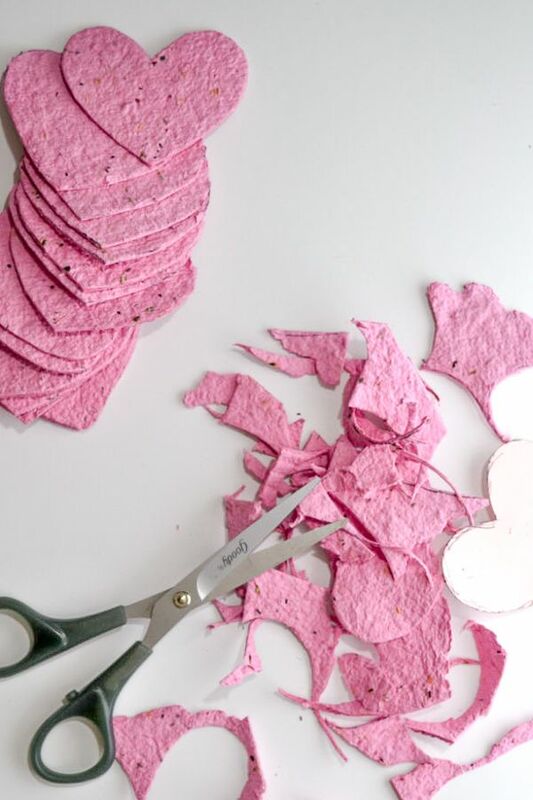 Use super sharp scissors when cutting your seed paper and save the scraps to plant on your own! First, you want to cut out your hearts. I made a little template by cutting out a heart from one of my test cards. Then grab a pen and outline all of your hearts on your paper using your heart template. I probably could have gotten 17 or 18 if I planned it out better, but such is life so I got 16. Also, if I had spread out my pulp a bit more, I also probably could have gotten more. Mine was kind of thick and warped a tiny bit when drying because of it. Cut out all of your hearts with sharp scissors. Don’t feel bad about the scraps – keep them for yourself and plant them! Then, print and cut your Valentines. 4 Valentine’s fit to a double sided page (each will be 3.5×5) – and you’re good! Cut them out (I did it by hand, but you can use one of these cool slicer things – I have this exact one that is less than $9, but it’s hiding somewhere in storage at my MIL’s, ha!) and then using a glue dot, adhere your seed paper to the card. Address and you’re done! Don’t let the ‘making your own seed paper’ part scare you off – I swear I did it all while taking care of kiddos, making dinner, and cleaning. It’s not as time-consuming or difficult as it sounds! But do remember – if you’re looking for an eco-friendly Valentine’s Day card and don’t want to make the plantable paper yourself, you can buy it premade above. Okay, so tell me – does making your own seed paper sounds doable? Have you ever used seed paper? Let me know in the comments! Looking for more fun Valentine’s posts? Check these out! Wow I’ve never made my own paper of any kind before. These are seriously adorable. 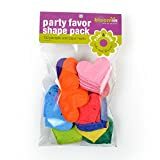 Even if kids aren’t in school, they would make great little things to give to aunts, uncles, and of course grandparents! I was obsessed with class parties too! These things always sound so good in theory for me, but I would probably end up doing something simpler. I can never find time for DIY! I really love this idea! The kids get too much candy anyway and a homemade touch is best for Valentine’s Day! Oh, I love this tutorial! Definitely something I’m going to try to recreate within the next few weeks! What a great idea! I love it! I am going to try to convince one of my kids to use this for their Valentine’s for school this year!